Social media platforms are an effective way to reach your audience, whether you’re an individual blogger or a Fortune 500 company. The problem is, if you’re just starting to experiment with social platforms, or even if you’re a social veteran looking to up your game, it’s difficult to pick the best social media management tools out of the hundreds that are available. Whether you need to manage multiple social accounts, listen and react to conversations, schedule posts, or measure results, we think your time is better used mastering social media instead of searching for the best social media tools. So now, we’re making that search much easier with the launch of SocialPiq. We’ve scoured the web for the best tools so you don’t have to. We’ve done the research, packaged the data in an elegant, functional design, and now we’re opening up SocialPiq to the public. 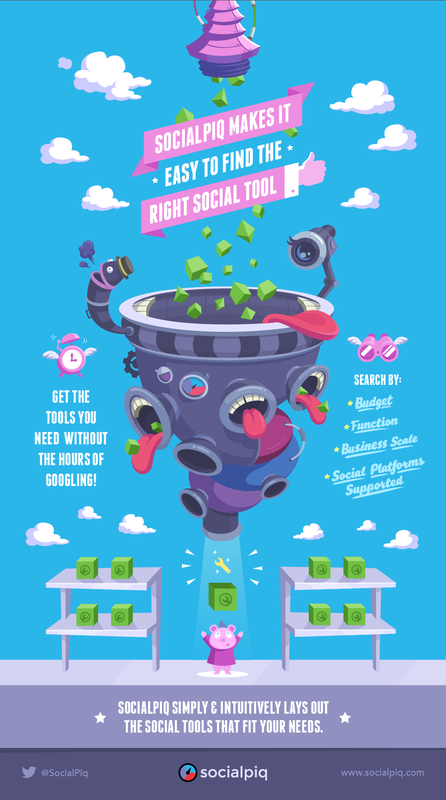 Use it to help you choose the right social media tool without the hours of Googling. 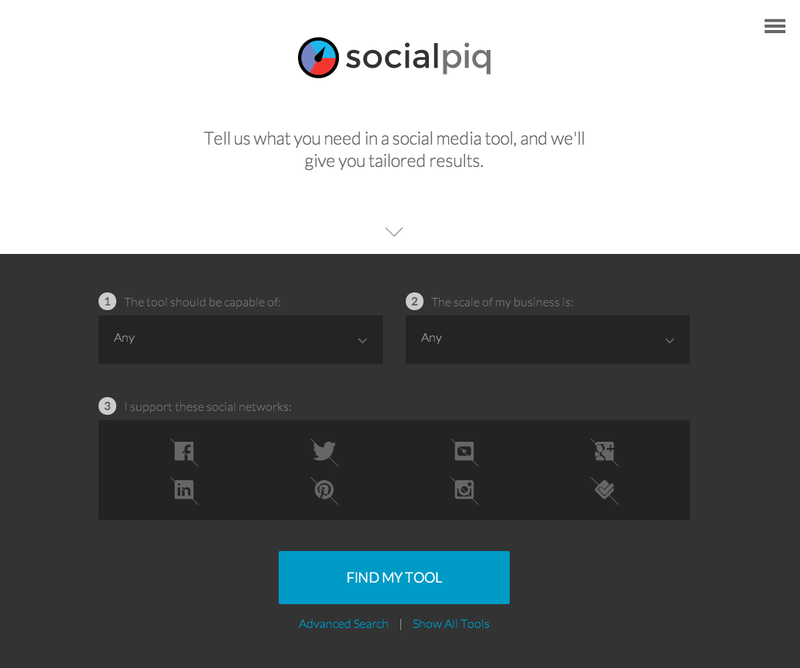 We created SocialPiq to answer the question that typically surfaces at the start of the social tool search process: "Where do I even start!?" First, you have to identify what type of tool you actually need. There might be a few suggestions from friends and colleagues, but opinions will vary and the social space can be rather enigmatic. Once you finally know what you need, most tools don’t make it easy to understand what they do unless you try (and many times, buy) them first. Sure, you’d like to try a few, but there’s no way you’re going to try a hundred. This confusion and inability to easily find what you want is frustrating, and can make the search seem daunting. The internet is supposed to make communication easier, right? To solve this problem, we developed a way to separate the social tool wheat from the chaff. We combed through dozens of high-quality social tools, evaluated them, categorized them, and created a way for you to winnow down your options by selecting your organization size, the price you’re willing to pay, the features you’re interested in using, and even the social channels on which you’d like to focus. Whether you’re a large corporation that needs to hear what customers are saying about your product; a small business that needs a social media management tool to schedule posts on Facebook, Twitter, LinkedIn, and Google+; or successful blogger looking to find top influencers in your industry, our goal is to make your selection process as simple and painless as possible.